This week has been filed with lost opportunities, missed connections and course corrections…or as I like to say, business as usual. 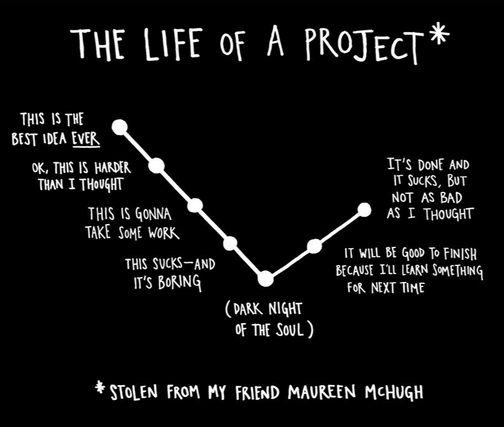 All of this made me think back to the book Steal Like and Artist and one of its more accurate diagrams. I have had countless ideas that I have thought: “Eureka, this is going to be awesome!” And then as I start to face the difficulties of bringing my fantasies into the realm of concrete, ugly reality will hit. Yup, making art is never a pretty or an easy road. This diagram is also a good representation for life, never quite as great as you imagined it could be, but not quite as bad as you feared. So when you face your next creative crisis know we have all been there and it’s ok, this too shall pass.